It was a two-eyed, two-horned, polka-dotted people eater! The song got it wrong all along. Here we were staring up at the skies in terror, expecting to find a flying purple monster with one horn and a single giant eye that would descend upon us and devour us whole. But, alas! The stories were entirely off. We first began hearing reports of the Blue Menace a few months back. We sent our scouts out to investigate the countryside for any evidence of the beast’s existence, but came back with nothing. Unfortunately, it seems that you have been caught. From our limited understanding of the monsters, they either eat you whole in a single gulp or they bite you and create a sort of slow transformation. 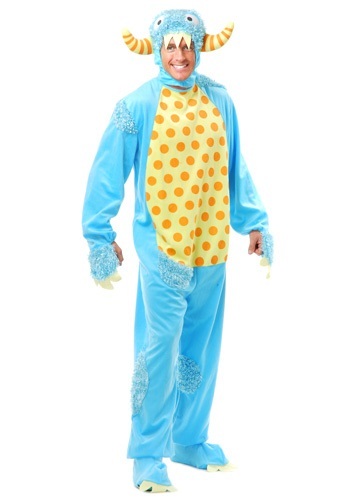 Either way, you’ll have to get used to this Adult Blue Monster costume. The bright blue jumpsuit is comfortable, which is what we are surprised to learn is exactly what the interior of many monsters is like, and features a bright yellow and golden polka dot pattern on the belly. Two sculpted horns and google eyes feature on the hood. Rumors are there are pink variations of the beast as well, so beware—they may travel in small packs!